Located in between Casablanca and Essaouira on Morocco’s Atlantic coast, the port city of El Jadida was founded in 1502 as one of the earliest Portuguese colonies in West Africa. The original fortified city was known as Mazagan and is recognized today as an important example of Renaissance Portuguese architecture. The last Moroccan territory to be abandoned by the Portuguese in 1769, Mazagan fell into disrepair but was ultimately re-built by Sultan Abd al-Rahman and christened El Jadida, or “The New.” El Jadida is now a popular summer vacation destination for Moroccans, many of whom flock to the nearby Mazagan Beach & Golf Resort with its 5-star golf course, restaurants and spa. Things to do range from admiring the 16th-century architecture of the old fortress to surfing and sunbathing on the surrounding beaches. El Jadida’s oldest district is the Fortress of Mazagan, the original Portuguese city. Inscribed as a UNESCO World Heritage Site in 2004, it is one of the earliest examples of a Portuguese military structure built with Renaissance-era adaptations to the invention of the firearm. Its star-shaped ramparts are impressive, measuring approximately 26 feet (8 meters) in height and 33 feet (10 meters) in width. From the patrolman’s walkway on top you can admire spectacular views of the old town and the Atlantic Ocean spread out below. Although the Portuguese destroyed one of the fortress’ bastions when they abandoned Mazagan, there are four remaining. From St. Sebastian’s bastion you have a birds’ eye view of El Jadida’s ruined synagogue. The main entrance to the fortress can be found just off Place Mohammed Ben Abdallah. The old city’s Portuguese cistern was constructed in 1514 as a warehouse or armory and was later converted to provide a reliable water source for the fortress’ inhabitants. Today, visitors can descend underground into a spectacular vaulted space supported by 25 graceful pillars. Light shines through a circular hole in the roof, creating shifting patterns that are reflected by the thin layer of water on the cistern floor. This atmospheric backdrop has served as a filming location for several movies including Orson Welles’ 1952 film "Othello." Photographers hoping to take their own shots should bring a tripod so that they can compensate for the low lighting with a slow shutter speed. The cistern is open daily and entry costs 10 dirhams. The Cistern Museum next door contains old photos and documents relating to the building’s history. If you have a particular interest in architecture, make sure to wander the old city on foot. Noteworthy buildings include the Church of the Assumption and the Porte de la Mer. The former was built in the 16th century in the late Gothic Manueline style while the latter is the sea gate through which Portuguese ships loaded and unloaded their wares. Also of interest is the communal bakery, where you can still watch local women baking traditional loaves; and the Grand Mosque with its rare pentagonal minaret. The latter is closed to non-Muslim visitors. Outside the old city, El Jadida Lighthouse is also worth a visit. Built by German prisoners of war, it is still in full working order. If the lighthouse keeper is there, you may be able to look inside. Once you’ve had your fill of old buildings, grab your towel and head to the beach. El Jadida’s main beach is a pleasant spot for paddling and people-watching. You can rent a sun lounger if you feel like tanning; or a parasol if you don’t. There is a good range of facilities nearby including beachfront cafés, shops and showers, making it the ideal choice for a hassle-free day out with the kids. However, the beach can get uncomfortably crowded in summer and cleanliness is sometimes an issue. If you prefer a quieter stretch of sand, head northeast of the city to El Haouzia Beach, where a partially submerged wreck is visible just offshore. The golden shores of Sidi Abed, located a 40-minute drive in the opposite direction, are even quieter. If great waves are a priority, ditch Deauville in favor of the beautiful beach at Sidi Bouzid. Situated southwest of the city center, the beach features a solid right-hand point break with a reef and sand bottom. If the right-hander isn’t operating, there’s a reliable break at the spot’s second beach. Swells reach up to 10 feet in season and waves can be 330 feet (100 meters) in length. Although the beach is busy in summer, it’s usually deserted in the September to April off-season when the best waves occur. At this time, swells are driven by the prevailing southeasterly wind. Sidi Bouzid is a 15-minute taxi ride from downtown El Jadida. If you’d rather save cash, take the public Number 2 bus departing from Place Mohammed Ben Abdallah. El Jadida has two main parks: Mohammed V and Hassan II (although the latter is known locally as Parc Spini and you should use that name to ask for directions). Mohamed V Park is located just behind El Jadida Beach and is the busier choice with plenty of exotic plants and a permanent exhibition of interesting statues. It’s a popular venue for al fresco concerts and festivals. During Ramadan, locals congregate every evening to share food, enjoy live music and listen to poetry readings. In contrast, Hassan II Park is a peaceful oasis frequented by students. It offers ample benches and picnic tables, and shaded pathways that afford an escape from the summer heat. There’s a boules lawn and a private tennis club with a public café where you can order light meals and refreshing juices. Keen nature lovers should plan an excursion to the coastal village of Oualidia. Located an hour and 15 minutes’ drive southwest of El Jadida, it’s a famous birding destination with over 400 avian species recorded in its lagoon and wetlands. Some of these are resident water birds; others are migrants who stop over en route from Europe to Africa in October (and vice versa in March and April). Possible sightings include the greater flamingo and the golden plover, but the most famous resident is a critically endangered subspecies of the Andalusian hemipode. A major draw for serious birders, this buttonquail is notoriously difficult to see and Oualidia is one of the last places it can be found in North Africa. For the best bird sightings, arrange a boat or kayak tour through La Sultana Oualidia hotel. Back at El Jadida, there are restaurants to suit every taste and budget. The most luxurious experience in the city itself is offered by Le Privé, a fine dining restaurant specializing in French and Mediterranean cuisine. For authentic Moroccan tagines that won’t break the bank, choose La Portugaise (located in the old city) or Kalaat Naji El Hadida. You can sample local catches at Chez Kiki, a highly popular hole-in-the-wall near the Central Market. Fried fish and calamari are the top choices here and will cost you just a few dirhams. For a more refined seafood dinner, book a table at Mazagan Beach Resort's Sel de Mer. There are many different cuisines represented in El Jadida including Japanese, Italian and American. For the best French pastries, make your way to Patisserie Tartine. El Jadida’s markets are mainly geared towards local Moroccans and are in many ways more authentic than the tourist souks of Fez or Marrakesh. You can watch vendors advertising their wares and haggling with customers; and even make a few bargains of your own. At the Old Market, located across the street from the Fortress of Mazagan, you’ll find fruit and vegetables, meat and seafood, clothing and household goods all separated into distinct sections. It’s a great place to stock up on cheap olives and spices. The Central Market mostly sells ingredients, but has some souvenirs too including fine lamps and traditional tea sets. For exquisite ceramics, head to Tayana Bouchrite which sells plates, bowls and tagine pots from Safi, Morocco’s pottery capital. Though pungent, the fish market is also of interest, especially for photographers. Golfers are spoiled for choice in El Jadida with two par 72, 18 hole courses within 6 miles (10 kilometers) of each other. The course at Mazagan Beach & Golf Resort was designed by South African golfing legend Gary Player and at 6,885 meters, is the longest course in Morocco. It comprises a series of sweeping dunes and valleys located directly alongside the beach. Course facilities include the Mazagan Golf Academy, a pro shop and a restaurant with stunning sea views. Alternatively, work on your handicap at the Pullman Mazagan Royal Golf & Spa course. It winds its way through scenic eucalyptus forest and features challenging holes designed by American architect Cabell B. Robinson. Green fees cost 600 dirhams, with discounts for hotel guests at both places and weekday discounts at the Royal. When you want a little unadulterated luxury, pay a visit to the spa at 5-star Mazagan Beach & Golf Resort. Open to guests and members of the public, it boasts 19 treatment rooms including two double suites with private saunas and Jacuzzis for couples treatments. Let the therapists cure your aches and pains with a hot stone massage; or increase your confidence with a rejuvenating body wrap or facial. There’s even a special treatment menu for children. You can also experience a traditional hammam complete with cold and hot saunas, while the salon offers everything from hair cuts to waxing. At the adjoining fitness center, private meditation and yoga classes can help you get into the vacation mindset. Prices vary depending on treatments but a full health and wellness day retreat costs 3,500 dirhams. Morocco’s largest city is just 62 miles (100 kilometers) away. 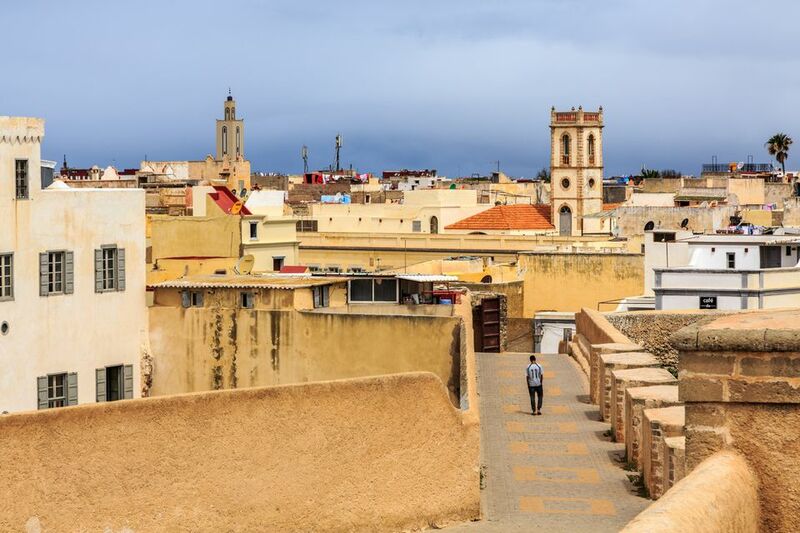 Discover the maze-like streets of the Old Medina (complete with its own Portuguese fortress, La Sqala); or the quality souvenir shops of French-built pseudo-medina Quartier Habous. If there’s one landmark you cannot miss, it's the modern Hassan II Mosque. Completed in 1993, it’s a showcase of North African craftsmanship, with fabulous mosaics, plasterwork and wood carvings that are viewable to the public on one-hour tours. Bergman and Bogart fans should pay a visit to Rick’s Café, an homage to the famous bar from the movie "Casablanca" and a great place for cocktails and live music. If you decide to stay overnight, make sure to check out the Corniche. Lined with restaurants, bars and nightclubs, it’s Morocco’s answer to Miami’s South Beach.